Over the last couple of weeks, I have been preoccupied with jury service. Yes, jury service. Naturally, I can’t say anything about the case, but boy is it interesting and I actually love going! The only thing I don’t love is the food. A beyond basic sandwich, packet of crisps and a bottle of water for lunch is a Halal Girl nightmare that is slowly coming true everyday, and I long for the weekend so I can get some good food in. Lately, I’ve been dreaming about honey, cream, and some good Turkish bread for dunking. Hm, where could I get that? Ah, at the Yosma brunch. I’ve visited Yosma before, late last year, after they fiiiinally made a switchover to halal. However, I wasn’t too impressed with their dinner options and ended up enjoying the desserts more. 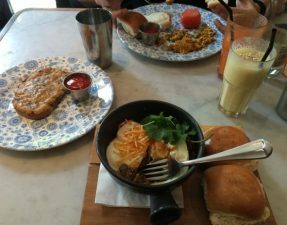 Well, it’s difficult to get brunch wrong so we decided to check it out over the weekend, alongside Omar and Mae of Bintang and Mamasons! [Sorry, my photo didn’t turn out!] Making brunch more indulgent with every bite, honey and kaymak is a classic Turkish dish. The kaymak i.e. clotted cream was thick and ridiculously velvety, and was served alongside a piece of sweet honeycomb and a simit (sesame bread). Notably missing was the mulberry molasses, but even more noticable, was the ratio of kaymak and honey to bread – we ended up having to ration ! I opted for this Turkish shakshuka complete with beef sujuk and yoghurt with chilli butter. Overall, the shakshuka was okay; I would have liked more flavour in the tomato sauce base as well as there being more of an oomph from the chilli butter on the yoghurt. 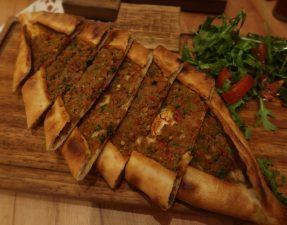 The sujuk was pretty good but I wanted it to be cooked more to have more of a bite. The accompanying slice of sourdough was ideal for mopping up the yolk. 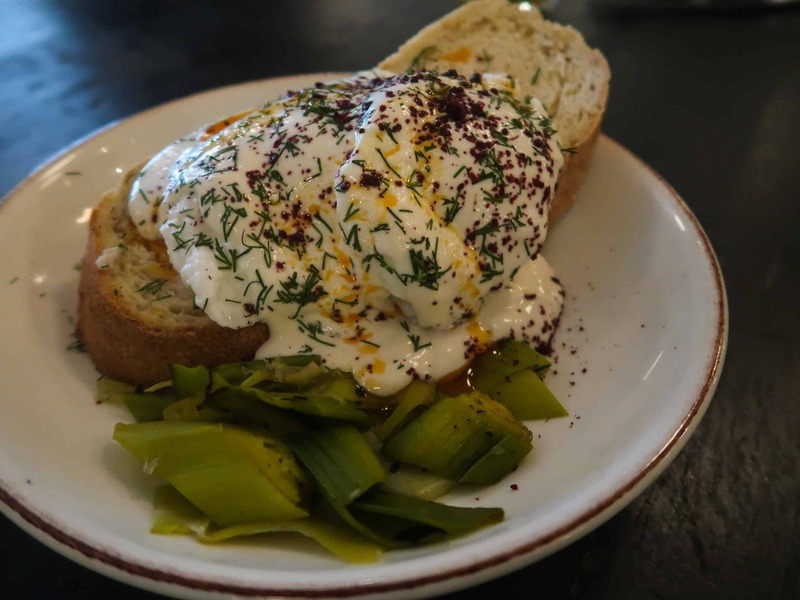 Omar has been dying to check out the ever-so-popular Turkish eggs a.k.a cilbir a.k.a poached eggs in yoghurt with chilli butter, especially since I haven’t stopped going on about it after eating Babaji Pide’s version. Both Omar and BW ordered the cilbir. A slice of toast (gluten free for BW, which they were happy to accommodate with!) topped with two poached eggs in yoghurt and finished off with chilli butter. As mentioned with the shakshuka, the chilli butter lacked a very needed kick that would have helped to add a ton of flavour to both the eggs and the yoghurt. The burnt leeks were a nice addition to the plate, but the cilbir was disappointing otherwise. 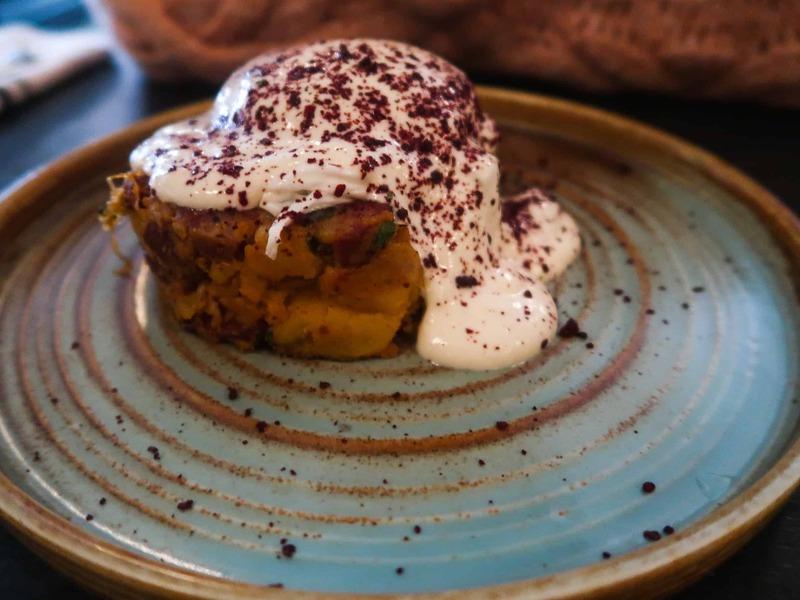 Mae went for this: a sujuk hash with a hot pepper dip, poached eggs, and all doused in yoghurt, with a slice of sourdough on the side. 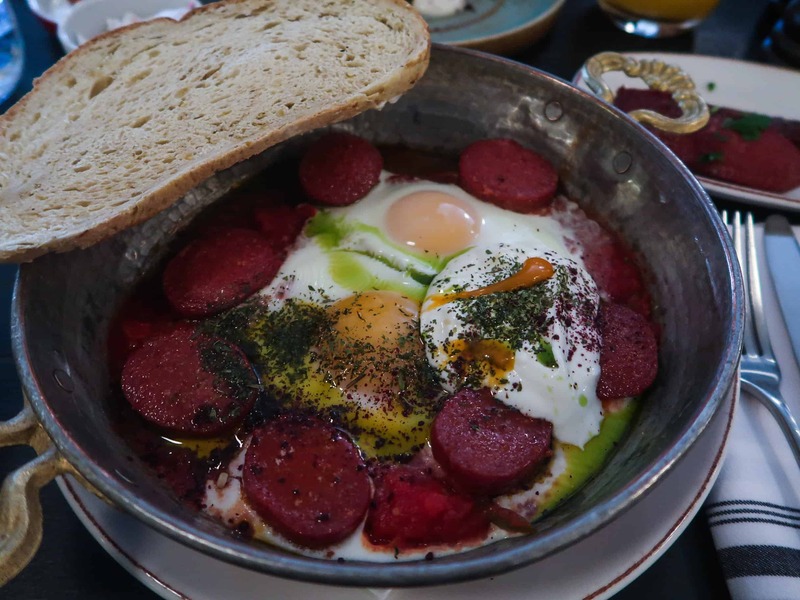 I didn’t get a chance to try the dish out, but Mae really enjoyed it, especially the sujuk hash. 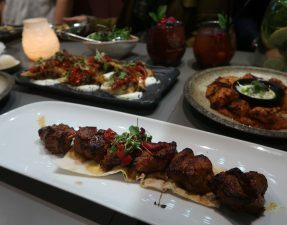 The total bill amounted to £70 for four people, including drinks and service, so £17.50 each. A somewhat expected and maybe reasonable, but I wouldn’t necessarily say worth it. A shame considering they’ve just made everything on their breakfast menu halal as of recent! Have you had a good Turkish brunch anywhere? Do let me know in the comments below! 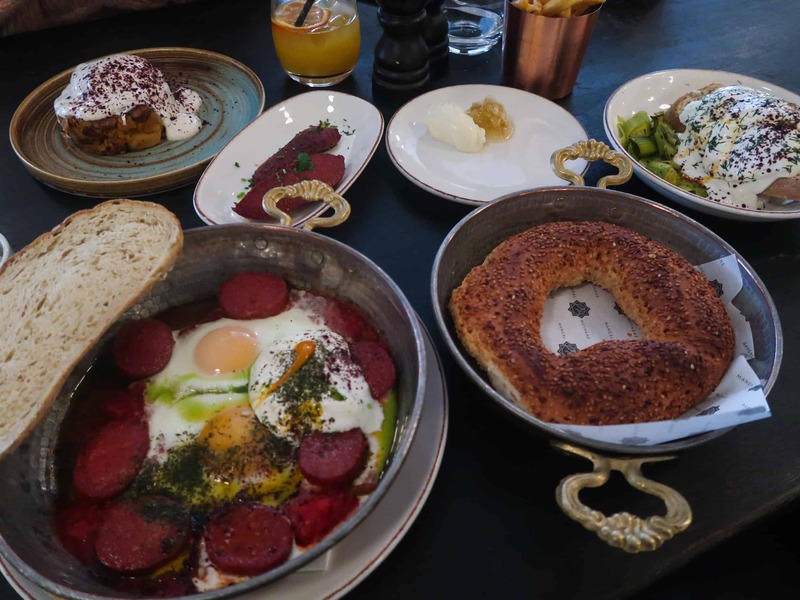 My favourite Turkish breakfast so far has been Babaji Pide, and you can read about it here. For Yosma’s website, click here. – All meat on the breakfast menu has been verified halal by the restaurant. – They are able to cater for gluten free.